FREE Bottle Of Vista Vapors E-Liquid! 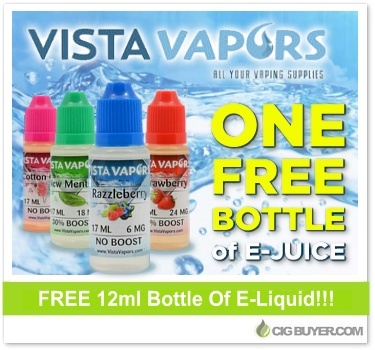 Have you taken advantage of Vista Vapors’ free e-liquid deal? This offer has been running for over a year now, so why not give them a try? With over 150+ flavors, Vista Vapors offers some of the lowest price, US-made e-juice on the market. Choose from dozens of tobacco, menthol, candy, dessert and fruit-flavored varieties – starting at $4.99 for 17ml. You can also purchase 32ml, 52ml or 102ml bottles. Choose from several PG/VG blends and optional flavor boosts. Vista Vapors E-Liquid - FREE 12ML BOTTLE! * No special coupon code is required. Expiration of this deal is unknown.